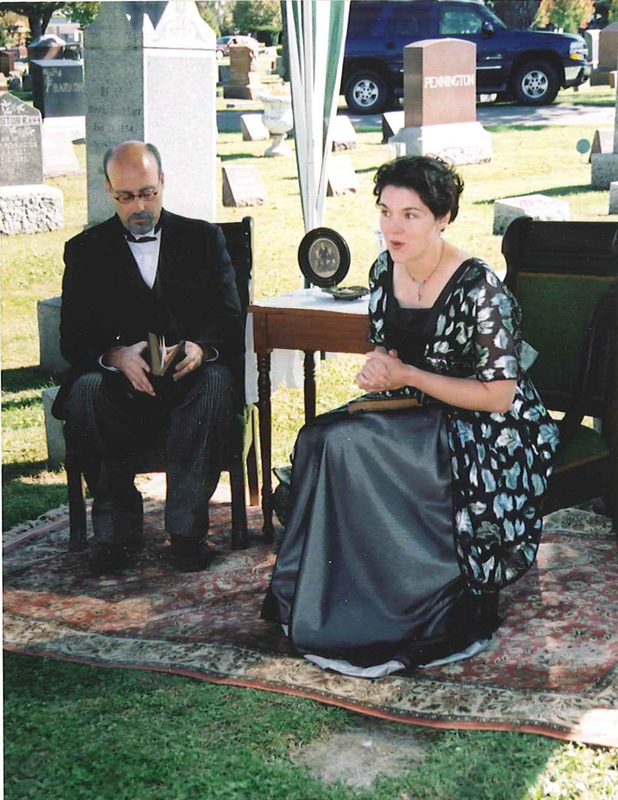 During the Plainfield Historical Society’s biennial Cemetery Walk, attendees visit several different gravesites to hear local residents, dressed as costumed actors, share stories researched by Historical Society members. Plainfield, Illinois, (population 37,334) is a rapidly changing community in the southwest suburbs of Chicago, shaped largely by its strategic location along historic transportation routes. The community’s population has grown from 13,028 in 2000 to 37,334 in 2007. Plainfield traces its roots to a Potawatomie village on the banks of the DuPage River and the French-Canadians who would trade with them. In 1833, Chester Ingersoll purchased land in the area and established the town of Planefield in August of the following year. Ingersoll platted 13 blocks and constructed several buildings. The village of Plainfield was incorporated in 1877. In the early 20th century, the Aurora, Plainfield, and Joliet Railway established streetcar service and a 20-acre resort, Electric Park, at Plainfield. Later, the Lincoln Highway was routed through the heart of the community and further stimulated commercial and residential development. After 1939, Plainfield enjoyed the distinction of being the crossroads of the two longest, paved highways in the world when Route 66 was realigned through the village. Plainfield participates in various regional heritage tourism programs that draw upon its transportation history. The village is featured in the Illinois Lincoln Highway Visitors Guide and the Illinois Route 66 Visitors Guide. The Lincoln Highway is designated a National Scenic Byway. The village is a member of the Illinois Lincoln Highway Coalition that promotes heritage tourism along the Lincoln Highway in Illinois. Plainfield is also part of the Heritage Corridor Convention and Visitors Bureau, which highlights communities along the Illinois and Michigan Canal. The Heritage Corridor Convention and Visitors Bureau views heritage tourism as a main part of its mission. The Plainfield Historical Society organizes a biennial Cemetery Walk in Plainfield Township Cemetery, with the sponsorship of the township and several local businesses. The 2008 Cemetery Walk featured more than 100 volunteers, filling roles from grounds crew members to actors. Attendees visited several different gravesites with local residents dressed as costumed actors at each site. Historical Society members developed the stories for each site. Profiled residents included farmers, businesspeople, early settlers, and soldiers. Recently, Plainfield has used surveys to identify historic resources and determine the preservation needs in the village. In 2006, a survey of more than 600 properties in the core of the village and a report outlining the history of the village were completed. Another survey of rural structures and farmsteads was completed the same year. The rural survey looked at the development of the area, described rural architecture, and provides recommendations for preservation. The village is planning a survey of Mid-Century property in the immediate future. Designated a Preserve America Community in October 2009.